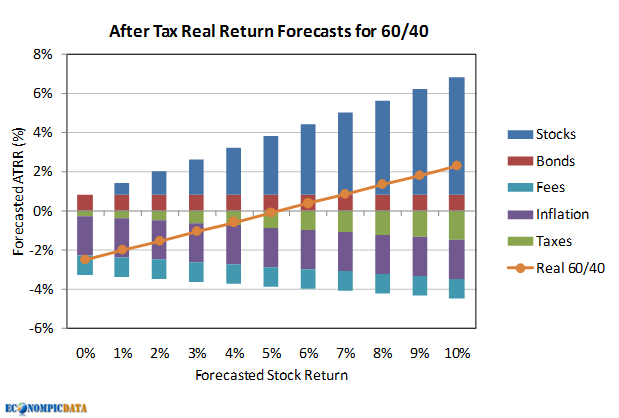 Think only a bear market can keep returns of a 60/40 near 0%... think again. Given the huge opportunity cost of allocating to cash or bonds at current yield levels, even generally optimistic return assumptions for stocks are enough to keep portfolio level returns near 0% real. The goal of this post is to set the stage for a future post where I hope to share potential solutions that may improve potential returns with a similar risk profile as a traditional 60/40 and to set proper expectations of what a 60/40 allocation dragged down by low yields may provide. Let's say you assume stocks will return 6% nominal going forward. Throw on the ~1% fees many financial advisors charge and/or the lower yields many investors are accepting by taking less duration risk / diversifying U.S. bond exposure to even lower yields abroad and an investor may break through the 0% threshold even with a 6% stock forecast. This coming from an allocation that has a historical standard deviation of roughly 10% over time.